Tomorrow, Anah turns fourteen. In the fall, she’ll be starting high school. If she were not adopted by this age, she would have remained in China for the rest of her life. Times like these often make me reflect. Out of curiosity, I went back to my first post about Anah, back in September of 2011, right when we shared with our church family about our decision. It has been humbling to see what God has done. Going back to 2011 me was hard. At that point, the optimism and joy that I had at the moment were untested and just theoretical. Little did I know then that I would be deeply tested and tried in ways that I could not imagine. In some ways, I see them now as a pep talk to myself to quell the sinking feeling I had inside. There is a sense of shame in how I handled things. I am embarrassed that I, though I teach and lead others, could not handle the pressure and cracked under it. I have felt like a failure so many times and wondered why God would pick me, as I was clearly so unfit for the job. But perhaps that is the point. God chooses the foolish, the weak, and the despised for that very reason—so that His glory may shine through, that we may boast in no one but Christ alone (1 Cor. 1:27-29). I may not want to see that in myself, and I may even hide it from others but I do not fool Him for an instant. In that post, I pondered some of the things I thought I would lose. Some of those have come true: I have had to bear a lot of extra work. Caring for Anah has been harder than I imagined. Her orphan history delayed her more than we expected. Seven years later, we still need to make sure she doesn’t wander off with strangers or get to the toilet on time. We saw the brokenness that goes deeper than Down Syndrome and at times it was more than we could bear. There were many times I regretted our decision. Back then, I said I believed that I could not outgive God. Now, I know this is true. As I look through all my questions, I can see how He has answered them. 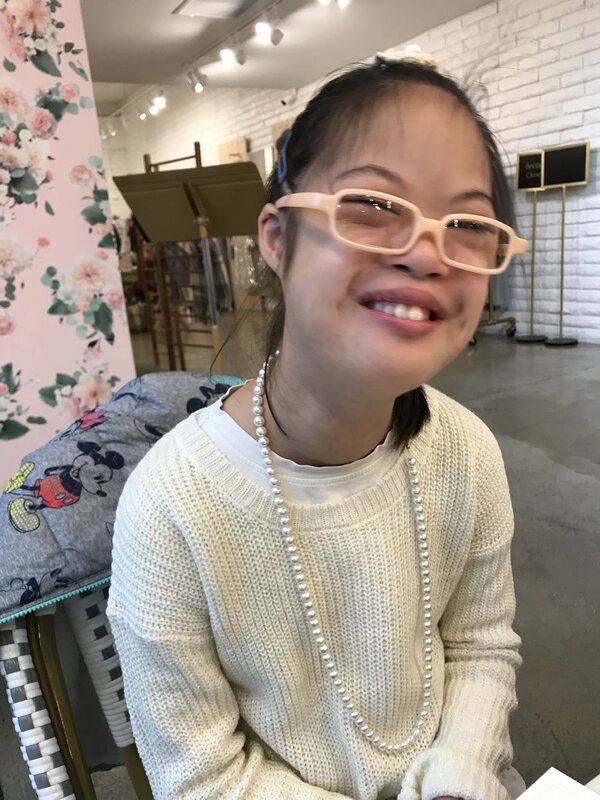 At first, I felt isolated and alone, like no one would understand or that by taking Anah into our home, we would experience the stigma of having a special needs child. Instead, God has blessed us with new and deepened friendships, relationships, and connections that have enriched our lives personally, putting us in touch with people we would not otherwise meet. I wondered if I would be able to work towards a Master’s degree. By His grace, I have taken three classes towards that degree already. The dream for a retreat home is still one for the future, but it is actually more real to me now than it was back then. Instead of giving up that dream, He has actually revived it in recent months. Not only that, He has given my husband and I at least six opportunities to host marriage retreats together since Anah’s adoption, about one a year. As for my writing, I wondered if I would ever have time to write again. For the first few years, I simply could not write, even if I wanted to. There were many silent years because my heart was too shattered to say anything that would bless others. But little by little, as He began healing my heart, the words started to flow again. I began to write, not as one who had emerged from the tunnel and seen the light, but as one who was walking through the darkness and grasping and crying out to God for help. Ironically, this chronicling of my journey has helped more people and expanded my reach more than the happy posts of a blissful life. I thought I would not be able to travel again, but since Anah’s arrival, we have been able to travel to twelve states from Maui to Washington D.C.—and even all the way to England. And while our nest is still very full, we already experienced a taste of the emptiness that we know will one day come. We had seen our daughter off to college and are preparing to launch our older son this year as he graduates from high school. Anah herself is out much of the day, going to school on the bus on her own and making friends at her after-school program. And our youngest doesn’t need me that much anymore. Yes, there was loss. There still is loss. I feel like I have been crippled and handicapped by Anah’s entrance into our family. But as I re-read my words, I am also realizing that not only many of those losses lost their sting, they been more than compensated. If we did not adopt Anah, I would have lost out on far more than I could gain on my own. I would have lost out on friendships, blessings, opportunities, and growth that I could not have appreciated or attained otherwise. Doors even now are opening up—from conversations and connections to ministry and service—that probably would not have happened. If I had said “no” to the adoption, I would have avoided a lot of trouble, but I can see that I would have missed out on even more. I quoted Romans 8:32—that verse has a new meaning for me now, as I look at things from the other side. Through this journey, I have come face to face with my own depravity and brokenness, not just Anah’s. He has stooped to care for me, an orphan with nothing to offer and bring me into His family, by humbling himself, bearing my sin and shame, and sacrificing his life for me. Indeed—how will He not also graciously give all things? As I sit here on the eve of Anah’s birthday, I can say there has definitely been a lot of mourning. I am still not sure if I can say that I feel like dancing. But I can sincerely praise and thank God for all that He has done—and all that He has yet to do. As you consider the hard things God may ask you to sacrifice—whether it be your comfort and convenience, your plans and preferences, or your dreams and destiny, I can testify that despite the hardship and struggle, we cannot outgive God. The sacrifice still stings but in the light of eternity, it is but a moment. Thank you for reading along and encouraging me along the way. I hope that you will join me in this celebration.